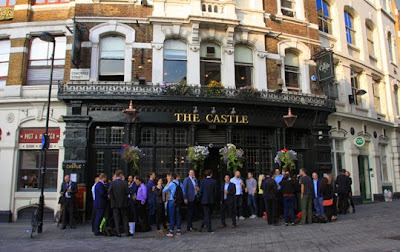 I went to the first meeting of the Nova Stellar Wicca Meet-Up Group at the Castle pub in Farringdon, London, on Tuesday evening and I thought it was a real success. The group - which is partly a Facebook page and partly a monthly pub moot - was started with the aim of offering an opportunity for genuine seekers to find out more about Wicca and to meet with initiates from covens based in and around London. It is intended to let people ask questions about the Wiccan tradition, help seekers decide if it is the right path for them and potentially give those who want to train with a coven a chance to find suitable groups. About 40 people turned up to Nova Stellar Wicca pub evening, at my estimate, and it was a really friendly moot. There was a good mixture of Wiccan initiates and seekers, from a range of backgrounds. Those initiated Wiccans who didn't mind being available to answer questions were offered little badges to wear - and I was happy to be one of them. The things I was asked about included recommendations for books on Wicca, information about open rituals and pagan groups in London and whether covens would welcome people with restricted mobility. My answer to that last question was that I've been in many Wiccan rituals with people with bad backs or difficulty walking and it was no problem if they needed to remain seated. Privacy is, obviously, very important. Some Wiccans work in jobs where they still might be discriminated against if it was public knowledge that they are witches, while many seekers would not even want their friends and family to know they had attended a Wiccan pub night. There is still a lot of prejudice and misunderstanding in the world, sadly. So, I haven't mentioned any names in this post and the photo above shows the outside of the pub with a crowd of people enjoying a drink outside long before the Nova Stellar Wicca Meet-Up Group took place. The pub meet itself is in a private upstairs function room. If you are genuinely interested in learning more about Wicca then I can recommend emailing the organiser at mickijl@yahoo.co.uk and asking to join the Nova Stellar Wicca Meet-Up Group Facebook page, where you can ask questions and also find out details of the next pub evening.